This production capacity calculator can be used by a manufacturing business to estimate the capital investment required in machinery and production facilities for inclusion in our financial projections template. The calculator is used to review a draft set of financial projections to ensure that the product units needed to satisfy sales demand and required inventory levels are matched by the necessary production capacity of the business. Further information on the calculation of production capacity can be found in our production capacity planning in financial projections tutorial. The production capacity calculator, which is available for download below, calculates the machinery, facilities, and labor resources needed to meet the production budget. Enter the production budget in units. This budget is based on the revenue forecast and required inventory levels used in the financial projections template. Our production budget calculator can be used to help calculate the amount to include. The calculator allows for two production shifts in one day. Enter the number of hours in the first and second shifts. For example, if the morning shift is 7.50 hours and the evening shift is 4.50 hours, enter 7.50 and 4.50 respectively, giving a total of 12 hours production time each day. Enter the number of production days in a year. For example is the business operates on weekdays for 50 weeks of the year, the number of production days is 5 x 50 = 250 days. The production capacity calculator calculates the number of production hours available for the year, referred to as ‘Peak capacity (hours)’. Enter the number of machine hours need to make one unit of product. For example if a product takes 0.5 hours of machine time to manufacture enter 0.5. The calculator works out the number of units a machine can manufacture in a year based on the peak available hours. This is referred to as the ‘Peak capacity (units)’. The production line will not operate at 100% efficiency. There will be times when a machine breaks down, needs maintenance or labor is not available. Enter a percentage which represents the efficiency at which the line will operate. The calculator works out the number of units a machine can manufacture in a year allowing for the efficiency percentage. This is referred to as the ‘Effective capacity (units)’. For example, if the production line operates at 80% efficiency and has a peak capacity of 6,000 units, the effective capacity will be 80% x 6,000 = 4,800 units. Using the information entered above, the production capacity calculator works out the number of machines required to manufacture to the level of the production budget entered in Step 1. The calculation rounds the number up to the nearest whole machine and uses this in further calculations. The unrounded answer is also presented for information purposes. Enter the floor area each machine needs for operation in square feet. The production capacity calculator works out the minimum total floor space required for the production facility. Enter the number of production staff required to operate each machine. For example, if for each hour the machine is operated it requires two people in attendance, enter 2. The calculator works out the total production labor hours required to operate the facility for a year. The calculation of labor hours is based on the number of machines, staff, and peak capacity hours. Enter the average cost of each machine. The calculator works out the estimated capital investment required in machinery. Enter the average cost per sq ft to build the production facilities. The production capacity calculator calculates the estimated capital investment in building production facilities. Finally, the total minimum capital investment required to provide the necessary production capacity is calculated. 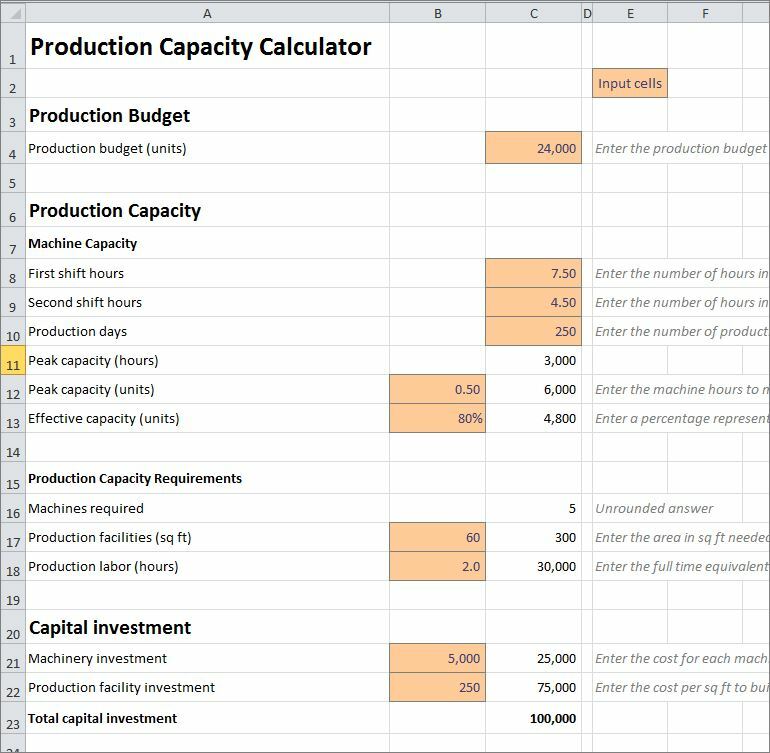 The production capacity calculator is available for download in Excel format by following the link below. Users use this production capacity calculator at their own risk. We make no warranty or representation as to its accuracy and we are covered by the terms of our legal disclaimer, which you are deemed to have read. This is an example of manufacturing capacity planning tools that you might use when preparing financial projections in Excel. It is purely illustrative of a production capacity planning software. This is not intended to reflect general standards or targets for any particular company or sector. If you do spot a mistake in the production capacity planning template , please let us know and we will try to fix it.